The Wargrave Local History Society resumed its programme of talks in September when David Ward, from the Reading Geological Society described the Geology of Bowsey Hill. The soil and rocks beneath us affect the crops that grow, the minerals available for buildings, and so on, and David took us on a 'virtual walk' from Penny's Lane to Crazies Hill, Holly Cross, Bottom Boles Wood and then back to Penny's Lane. Many of the rocks found in the area are only found in the Thames Valley between Newbury and the Essex coast. At the deepest level is the chalk laid down around 65 million years ago. Above this are a layer of clay with flints, then the Reading Formation of clay and sand, and the Harwich Formation sands, all of which are around 58 million years old. Above those are the London Clay - about 55 million years old, and then river terrace deposits, which are 'only' about 250,000 years old. Penny's Lane is set down in the chalk layer, with a lot of flints on the surface once beyond the houses. The geology is not easy to see here, but further up the hill, at Hennerton Golf Course, the ground was cut back about 2 years ago to reveal the chalk strata. It was laid down under a vast sea - the same type of chalk being found on the east coast - and Denmark and Syria. As the sea was relatively shallow (about 2-300 metres) and it had little coastline, the chalk was not contaminated by mud. The chalk was formed of microscopic coccolith shells, with a calcite skeleton, that lived in the warm, shallow, sea. When the coccoliths died, they fell to the bottom of the sea, forming the chalk layer. Within this round flints can be seen. These would have been formed when crustaceans burrowed into the sediment, secreting a substance to bind the sides of the burrow. When air got into these, the soil became more acidic, so that silica was precipitated from the ground water, forming tubular flints. In some cases, more material was deposited, forming larger, knoblier flints. Moving towards Worleys Farm and Cockpole Green, the eroded surface on the top of the hill has a red clay with flints and pebbles in it on top of the chalk. How these were formed is still something of a mystery - possibly the pebbles coming from another source in the London clay. Nearer to the Crazies Hill road is a pale brown sandy clay - the clay looks a green and white mottled colour when it appears freshly at the surface, and is typical of that laid down in an estuary, rather than an open sea. This type of clay was found to be good for brick making, and the path in this area is largely formed of broken bricks. These were not bricks from a demolished building, however, but misshapen unused examples. As such they were waste material - and waste does not normally get carried far. The nearby building being called Kiln House was a clue to their origin, and there was an extensive clay pit behind the house. In the mid 19th century it had been found that adding a small amount of chalk to the clay made stronger bricks - and so horizontal adits had been driven from the clay pit to extract some chalk. The result of making such holes into the chalk is to make the structure somewhat unstable (as was recently discovered in Reading, when the ground collapsed, creating 'holes the size of houses'). From here, it is a short way to Rebecca's Well. The reason for its location is the geology. The Reading bed clay is impervious, whilst the Harwich Formation sand above is not. As water runs down through the sand, it collects on top of the clays, and runs out at the boundary level as a spring. Further up the lane the wood, nettles, trees and brambles would normally mean little of the geology could be seen - but the local badgers help, as in creating their setts they had thrown out sand onto the surface. At the top of the hill, the work of a bulldozer had also exposed the sandy soil. These sands revealed some interesting structures - burrows about ½" wide formed by crustaceans - probably as the sandy layers were being formed. Around Holly Cross and towards the top of Bowsey Hill, London clay lies over the sandy layer. It is waterproof, so water tends to collect in any hollows, making for many ponds and puddles. The same sort of clay is more easily seen at Sheppey, in Kent, where the effect of rain at the top and the sea at the base erodes the clay by about a metre per year. In the process, the fossils fall out to be easily found on the beach. Some of the wood fossils are found to be full of holes lined with a white material left by teredo worms. It was the need to avoid such in the timbers of ships that led to them being given copper bottoms. Down towards Warren Row there are pebble terraces formed in the Palaeocene era as the result of cold glacier forming conditions. Much of it had to have been carried a long way, such as the quartz also found in North Wales or around Birmingham. Down through Lower Boles Wood, sand can be tracked along the valley of a small stream. It is graded from coarse gravel at the top to fine sand below - the effects of geology in action. Returning to Penny's Lane, the valley there has sharp sides, suggesting that it was cut by water, but as chalk is permeable there is no stream there. The erosion that formed the valley, must therefore have taken place when the water in the rock had frozen, in the Palaeocene era. 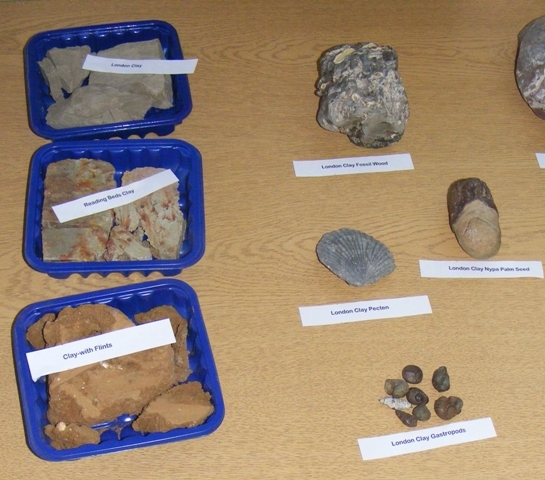 David brought a selection of samples of rocks that could be found in the area around Bowsey Hill, and the audience were able to study those and geological maps after the talk, whilst enjoying their refreshments - including rock cakes, of course! The next meeting will be on Tuesday, October 13th, when Roy Sheppard will recount the History of Postcard Collecting - how it began and how it has changed over the years, and then on Tuesday, November 10th Anthony Poulton-Smith - the author of a recent book on Berkshire's Place Names, will explain their origins, meanings, and how they have changed.